Brad Marsh, the former stay-at-home defenseman who played 15 seasons in the NHL, feels he might be in better shape today than he was when his career ended at the age of 34 in 1993. Now 54, Marsh knows his physical condition, no matter how strong it may be, isn't going to get him on the ice if his team needs a goal Sunday night during Kraft Hockeyville's celebrity/alumni game at the Stirling District Recreation Centre in Stirling-Rawdon, Ontario. "I don't know who's coaching, but whoever it is, I guarantee I still don't get to go on the power play, even in the alumni game," said Marsh, who had 23 goals in 1,086 career games with the Atlanta/Calgary Flames, Philadelphia Flyers, Toronto Maple Leafs, Detroit Red Wings and Ottawa Senators. 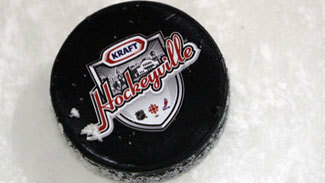 Stirling-Rawdon will receive $100,000 in arena upgrade money from Kraft Canada for winning the Hockeyville competition, and enjoy a visit from CBC's "Hockey Night In Canada." The town will also receive $10,000 in food bank donations from Kraft Canada. The three days of festivities include a parade with the Stanley Cup, an autograph session with former players, and the celebrity/alumni game at the 3,000-seat recreation centre. A preseason game scheduled for Oct. 3 between the Columbus Blue Jackets and Toronto Maple Leafs has been postponed until 2013. Also scheduled to take part in the alumni game are Rob Ray, a former Buffalo Sabre and native of Stirling-Rawdon, ex-Maple Leafs Gary Leeman, Brad May, Laurie Boschman, Dan Daoust and Mike Johnson, and former Blue Jacket Mike Gaul. Paul MacLean and P.J. Stock, a former Boston Bruin, will take the ice and represent CBC's "Hockey Night In Canada." "The alumni games are always fun," Marsh said. "I don't play in a lot of them. I've played in alumni games, but I don't play hockey much anymore. I know a lot of guys are still playing in leagues and all that kind of stuff, but I don't have the time or the patience to do that, so it's always fun to play against the alumni guys." Marsh spent parts of three seasons with the Maple Leafs and played his final NHL season with the Senators. He was teammates with Leeman and Daoust in Toronto and played with Boschman during his one season in Ottawa. "It's kind of neat because I get to participate in both alumni events," Marsh said of his ties to the Maple Leafs and Senators. "So in and around a Leafs-Sens game there's a lot of ribbing in the dressing room." Marsh spent a large part of his summer cycling across Canada in an effort to raise money and awareness for the Boys and Girls Clubs of Canada. It can only serve to help him playing against former rivals Sunday on what should be a memorable night for the small town of Stirling-Rawdon, which has a population of about 2,000. "I'm actually in better shape than I was 10 years ago and I've been retired for 20 years now," Marsh said. "We tend to get out of shape and that was me to a 'T.' Now, at 54, I'm in pretty good shape, almost the same shape as when I played, so the games are a heck of a lot easier now. I can play any amount of ice time the coach sends my way."